Here you can read my opinion on food, local events, technology and more! When looking through my Twitter feed earlier today, I noticed CloudFlare announced they’d rolled out HTTP/2 to all clients who use SSL/TLS connections. I’ve been using CloudFlare on a few of my personal sites for a while now, with good results, and saw their blog post earlier in the year mentioning HTTP/2 – so today’s announcement was great to see! We’d looked into HTTP/2 at the office the other week, but we’re using cPanel/WHM & Apache on our production server, and with EasyApache not yet supporting the latest Apache 2.4.17 (which includes the required mod_http2), we were left waiting patiently for the update to appear in EasyApache. But hey, CloudFlare just announced HTTP/2, so why wait?! Since I still wanted to have have the live (non-HTTP/2) site as a comparison, I used WHM’s Transfer Tool to create an exact copy of the website on a dev server. I was initially going to setup a sub-domain for testing, but realised CloudFlare doesn’t support CNAME pointing on their free plans, so I ended up using a spare domain we had in our Namecheap account. After setting up the domain in CloudFlare and pointing the DNS records (which took less than a minute to propagate), I just needed to update the database (for a Magento site in this case) to reflect the new domain. I also created a quick self-signed SSL certificate in WHM, then set the SSL feature in CloudFlare’s panel to ‘Full’. (side note, if you’re not already taking advantage of CloudFlare’s free SSLs, grab an account and try it out for yourself – you’ll never need to buy an SSL certificate again!). To minimise CloudFlare’s CDN having too much of an impact on results, I disabled as many of CloudFlare’s caching features as I could. Supporting only a few parallel resource downloads, we can see that using HTTP 1.0 delays the loading of resources on our web server by just over 3 seconds. 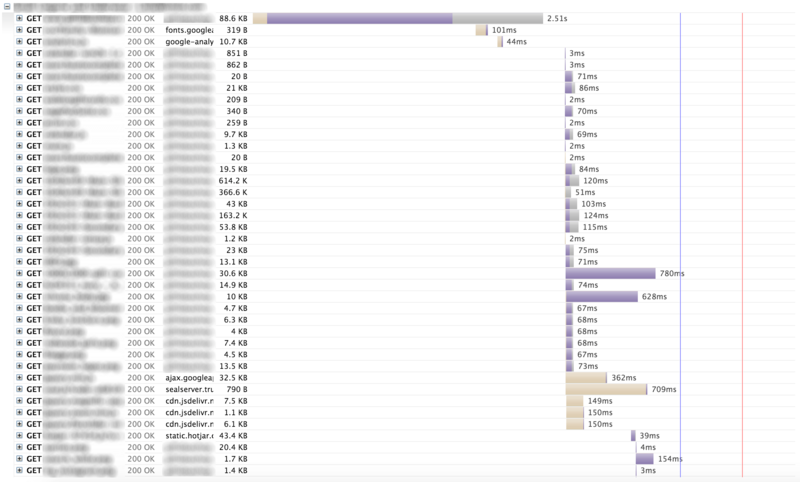 By comparison, the dev site I setup gathers (almost) all resources in parallel via a single TCP connection – adding no more than a second to the load time. I’d like to also note that the standard website is on our production server (latest spec, SSDs etc), whereas the HTTP/2 dev environment is on an older-spec development server. This should explain the difference in initial connection times for those wondering. I’m interested to see how HTTP/2 unfolds over the next few weeks. 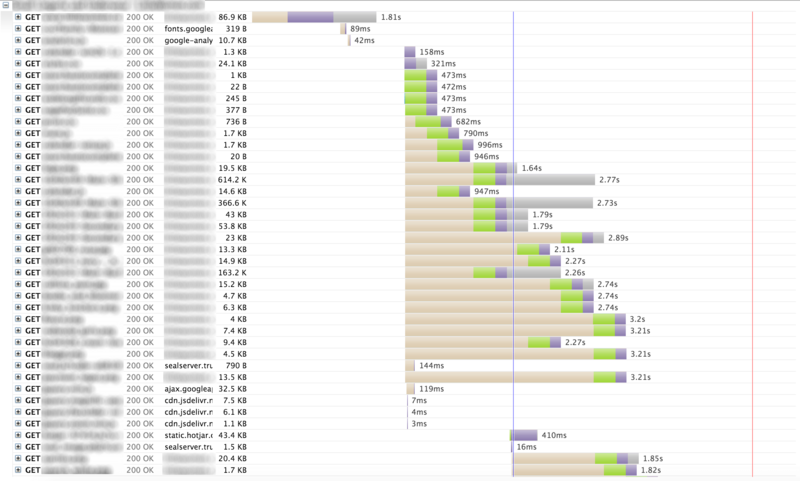 If anyone uses New Relic’s Real User Monitoring or similar, I’d love to see a screenshot showing average load times for website visitors before and after HTTP/2 roll-out. In the meantime, I’ll see if I can gather a few screenshots comparing real-user load times before and after. If you’ve got a web hosting account, you’ll probably be using cPanel to add domains, create email accounts and check on disk usage. 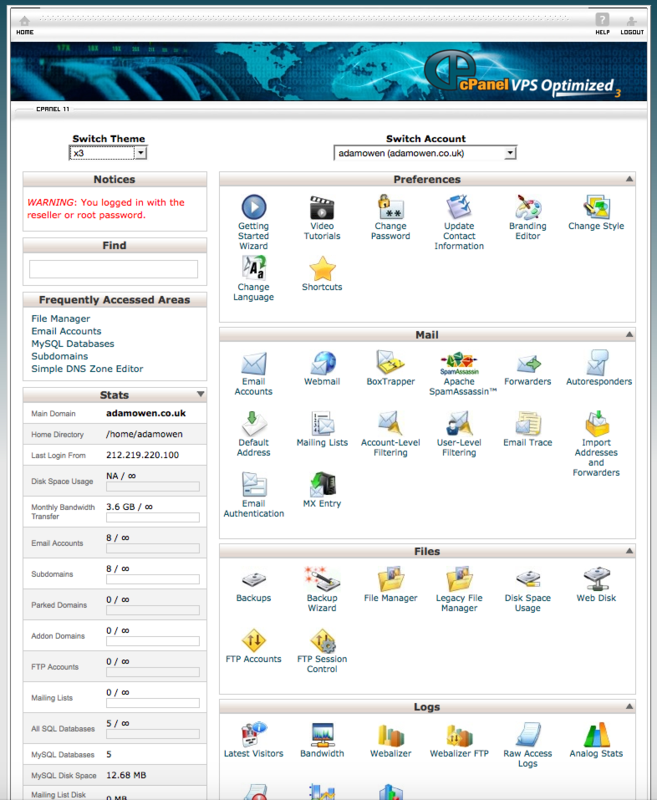 For as long as I can remember, the default cPanel theme has been X3, which, if you take a look at it today, looks incredibly outdated – both the UI design and the icons. Though people swear by cPanel/WHM as the best and industry-standard web hosting control panel, I have to agree with others when they say it looks ugly. So I was happy when I heard cPanel are planning to replace the outdated theme altogether with a newer, flat design theme called Paper Lantern. 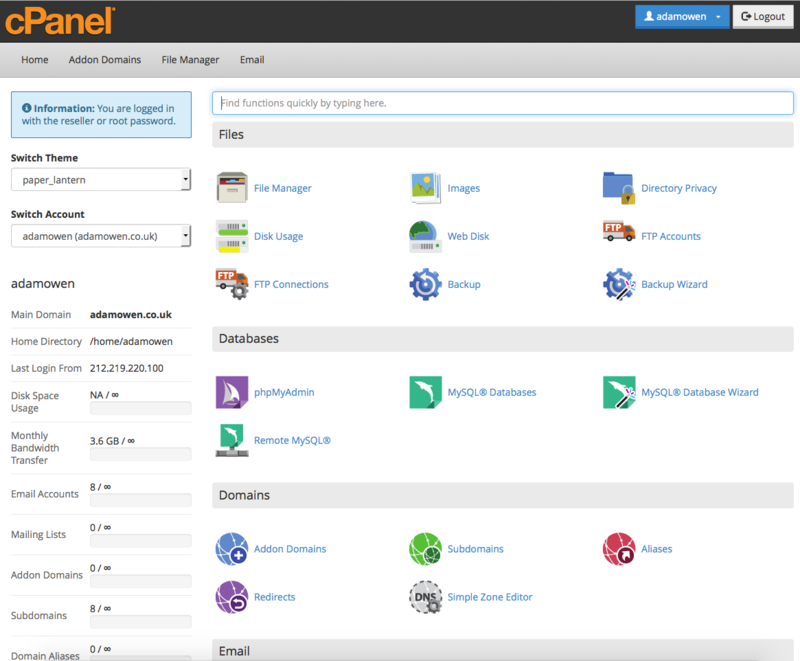 The new Paper Lantern cPanel theme is available on cPanel 11.46+, and will soon completely replace X3. What are your thoughts on the new Paper Lantern theme? I’m still getting used to it, but I think it’s because I’ve been used to using X3 for so long! I take it back about cPanel being ugly. The Paper Lantern theme is pretty damn nice. Held annually in the US (with the exact city changing each year), with a more compact version in Asia, HostingCon is a well-known event in the web hosting and domains industry. Whilst this event is usually held across the pond, it’s organisers decided to bring a smaller version of the event to Europe for the first time this year. Amsterdam to be more specific. I had first planned to spend the week in Amsterdam to live-blog/tweet the event, but other commitments took priority. Watch this space for next year’s HostingCon Europe though! When deciding on a web host for your website or blog, there are a number of things to consider when comparing web hosting plans. Whilst you should never shop solely on price when it comes to web hosting, price is of course still an important thing to consider. Though if the price seems too good to be true, you’ll likely get what you pay for and suffer (either from downtime, poor support etc.) as a result. How much disk space does your plan come with? Do you upload many images, maybe you’re a photographer with a portfolio site full of photographs? In this case, you’ll need a web hosting plan with plenty of disk space. Many web hosts offer plans with unlimited disk space. Do make sure you read the terms & conditions though – you can’t simply upload your movie collection. Many of the ‘major’ web hosts only have servers in the US, so if most of your visitors are in Europe, you may want to look elsewhere. Whilst you could use a CDN, it’s always best to have your main server in the country which most of your visitors are located in. In my case, this site is hosted with WebHostingBuzz in England, UK. Always look for a web host offering at least 99.9% uptime. You can then monitor uptime using a service such as Pingdom, and will be entitled to complain if the guaranteed uptime levels are not met over the course of a month. Which control panel do they offer? cPanel? Plesk? Maybe even a custom control panel? cPanel/WHM is my personal favourite platform, not just because it has plenty of features, but also down to the fact that it is quick and easy to migrate from one host to another – the majority of hosts will even take care of the migration process for you free of charge if you use cPanel. – HostGator – Low-quality, unreliable web hosting. – 1&1 – Terrible ‘robotic’ support team.